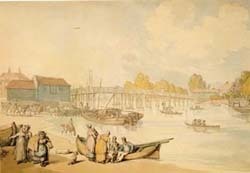 For many hundreds of years the only bridges across the lower reaches of the Thames were London Bridge and Kingston Bridge. The first bridge dates back to 1219 and was constructed of wood. In 1825 a new stone bridge of five elliptical arches was planned and designed by Edward Lapidge. It was faced with Portland Stone with classical Greek balustrades. It was 382 feet long and at that time 25 feet wide. In 1828 it was opened by The Duchess of Clarence,later to become Queen Adelaide as Consort to William IV. In 1906 tram lines were laid across the bridge making it the first Thames Bridge to have trams crossing it. By this time the traffic and the trams had increased a great deal making it even more dangerous for pedestrians. The death of a young cyclist made the authorities take action. In 1911 Mott and Hay were engaged to widen the bridge to 55 feet by extending the bridge on the downstream side. They were required to ensure that the original appearance of the bridge would be preserved. The widened bridge opened in October 1914. In 2000 the bridge was widened and strengthened yet again and accommodated bus and cycle lanes but this time on the upstream side. Its original appearance was preserved once more. It was reopened by HRH The Duke of Kent on Friday 29th June 2001. Kingston Bridge is a strategic crossing point over the River Thames in South West London. Today it carries a total of approximately 50,000 vehicles per day with some 2000 vehicles per hour crossing in each direction at peak times.